In order to reserve a storage unit, you must first contact our Property Manager for rates, availability and unit number. 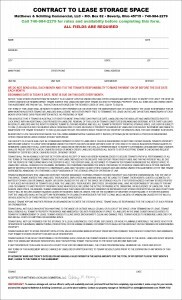 If/after a storage unit has been assigned and a deposit has been paid, print the contract at right and fill it out completely, sign and date it, make a copy for your records, and send it to Matthews & Schilling Commercial, LLC. To contact our property manager, call 740.984.2279 or email ashley@kbirealestate.com. Call 740-984-2279 for rates and availability, print and complete the form at right and return it to us. Thank you!